‘La Tulipe’ is the twenty-sixth release of Aftertech Records. In this EP Bessiff is the man of the hour, heard as he has never been heard before. He has really outdone himself with wonderful captivating and powerful melodies. Supported with remixes by Future-E and We Need Cracks this has become an EP that will be remembered through the ages! 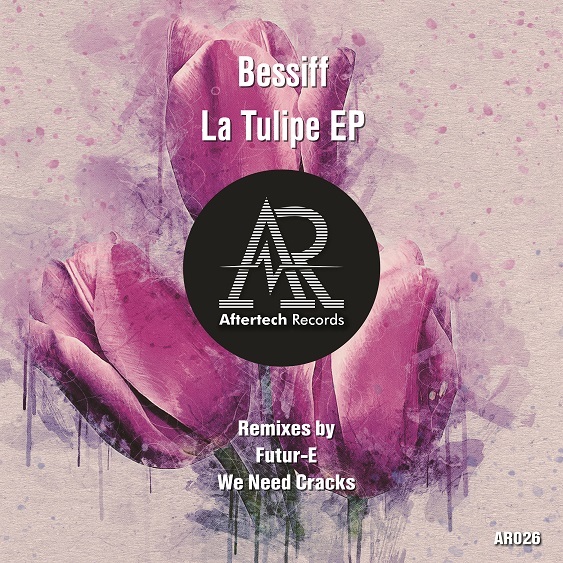 The title track La Tulipe grabs the attention right from the start with Bessiff’s signature lead-sound. Slowly a melody unfolds while a lightly growling bassline is growing in strength. All of this works together with a groovy percussion and echoing claps. When the first break arrives a new melody is introduced gluing it all together into this wonderful masterpiece! Rose Noire starts out a bit more groovy and less sweet. The focus lies very clearly on the groove with a bassline that doesn’t mess about. Then a clear, light and airy melody arises, floating softly above the rumbling bass. After the break the melody switches from sweet to powerful empowered by the bassline that has grown with immense power. It’s a smartly structured track in which dreaminess and power is beautifully combined. With Future-E’s remix you hear a different vibe right away. A fast never-ending melody sets the tone right from the start. Gradually the old-school House synth is taking over from the break, adding groove to the already very danceable track. A simple, high and clear arpeggio in combination with crispy hihats, completes this uplifting audio-composition in an effective way. We Need Crack’s made the more subtle remix of the two. It starts out dreamy which is strengthened by a kind of vocal-like pluck. Although of its dreamy vibe the track has something clubby as well. A light arpeggio slowly works towards a break after which the bassline is finally introduced. The moment they make you yearn for so badly. The arpeggio works in perfect harmony with the bassline as if it is floating on the waves of a deep sea. A perfect addition to this great EP! This EP will get a special place with the dreamy clubbers for sure!